Until 1966 Sheringham had two Methodist Chapels, these were situated in Station Road, (at the junction with New Road) and on Beeston Road. They were known locally, because of their sites within the town as `top` and `bottom` chapel. In 1962 a decision was taken by the two societies to amalgamate and build a new Church. This happened for a variety of reasons. 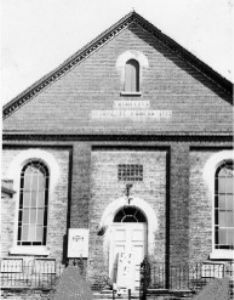 A number of things had been done jointly during the war and in the years after, and members began to think progressively, that with the Methodist Union in 1932 it was time the two Sheringham chapels got together. Also, the maintenance of the two properties was very expensive and it was found that the roof at Station Road, was in a dangerous state. Selling the two chapels and starting again together was the only way likely to give a joint Church a new impetus. So fund raising started for the new Church. This was done in lots of ways, and with many special events. The Sunday School children took part by helping to sell `Building Bricks`, these were books of paper bricks which were sold at 5/- (25p) each, to friends, family and anyone they could think of! Another fund raising idea was the tablecloth of signatures (this can be seen on the About the Church page). Grants were also obtained from various sources. 28th. May 1967 and was participated in by different Churches within the town, as well as representatives of groups within the Church. The foundation stone, which can be seen on the right of the main doors, was laid on 16th. September 1967 by Alderman W. H. Hunter-Rowe JP., of Wisbech. 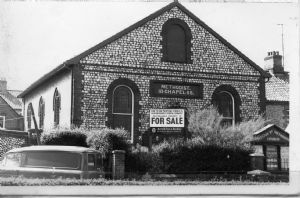 Station Road chapel was closed in 1966 and the congregation and Sunday School joined with Beeston Road until the new Church opened. The final cost of building the Church was £38,000. On Saturday 22nd. June 1968 St. Andrew`s was opened, and the building dedicated by Rev. E. Gordon Rupp M.A., D.D., D.Theol., The President of the Methodist Conference and Principal of Wesley House, Cambridge. During 1991, the Church was fitted with a loop system for the hard of hearing. Many other memorial gifts have been given to the Church, and these include the wedding kneeler, choir/organ bookcase, aisle stewards cupboards, vestry furniture, Bibles, Hymnbooks and the 1999 Methodist Worship Books. The ancillary building includes a hall which can seat 200, and has a stage, a smaller hall which can be divided into two by a partition, kitchen and toilets. In 1980 an extension was built to provide a Coffee Lounge, which is used for various small gatherings. A store room was also added at that time. Alterations were made to this area in 1995 to provide a toilet for the disabled. In 1998 the Kitchen underwent a transformation with a complete refurbishment being carried out, at a cost of around £11,200. This has given a vastly improved working environment for all aspects of catering. A total Refurbishment of the Worship Area was undertaken in 2002, when a new suspended ceiling was installed, the whole area rewired and new lighting put in. All the symbolic features of the Church (described in About the Church page) were maintained. The cost of this work was just under £16,000. This was raised through many fund-raising events, and a section of the lighting/electrical work from donations in memory of a Church member. At this time, two sections of the original pews were removed to make better accommodation for wheelchair users at services and events. In 2009 a new audio system was installed by DM Music for churches, and this comprised of microphones and speakers in the choir stalls, as well as in the main church sanctuary. A projector and screen were also installed, as were speakers in the Side Chapel and vestibule for the sound system. We are always anxious to maintain the high standard already achieved in the facilities, decoration and condition of the whole building.